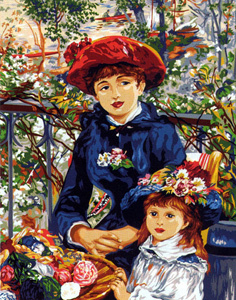 Welcome to the home of high quality needlepoint canvases and kits from Europe, England and New Zealand, hand-painted American needlepoint canvases and kits, and the things that go with them. We know it's becoming harder to find a good neighborhood needlepoint store, especially one with a good selection of top quality pieces, so we've collected the "good stuff" here in one place. Somewhere on this site is just the right piece, perfect for your next needlepoint project. So, take a breath, take your time and choose from some of the world's best designers and manufacturers. You will benefit from our nearly 40 years of gathering this information and developing relationships with these most renowned European and English designers and manufacturers. It's a wonderful world of stitching delight, very satisfying to the eyes, the fingers and the soul. We hope you enjoy your visit with us. These years and experience have given me an appreciation of fine quality European needlepoint. 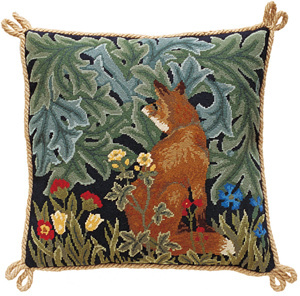 Over the years I have found this type of needlepoint to be difficult to find in the US, so I have developed contacts and accounts with the manufacturers in England, France and elsewhere. Since I appreciate them so much, and because others have shared my enthusiasm for them, I have decided to make these heirloom-quality European needlepoint canvases and kits available to those who might appreciate them as we do. If you're not already acquainted with these fine needlepoint suppliers, we think you're in for a very pleasant experience. Every item on this site is first-quality; there are no "knock-offs," seconds, damaged, or very old stock. Most of our product comes directly from the designer in England, France or here in the US. We have included only the canvases and kits that we know from experience are top of the line. These canvases are exquisitely detailed. You can be sure that, when you receive your needlepoint, you have the best quality canvas and yarns that we can make available to you. Life is too short, and stitching time is too limited, to spend on anything but the best. We have tried diligently to help you get around easily on the site. Should you get lost, just use the menu at the top of every page. There are well over 5000 items on this site, but they have been grouped logically (at least we think so) and the Search function is never more than a click away. Please take your time and look around as long as you please. We believe it will be one of the most pleasant experiences you'll have today. If you have any questions, please email me, or give me a call at 1-888-801-3084 anytime.